If ever there was a friend, colleague or teacher someone would want to have, it would be Angela Kellogg. Not a day goes by that the Elm Grove Middle School Paraprofessional is not willing to go out of her way to help. She has that “go get them” attitude, which her co-workers will tell you is contagious. Needless to say, she is loved by faculty, staff and student body alike at The Grove. It is those attributes that have earned Kellogg the honor of being named Bossier Federal Credit Union/Bossier Schools’ first Gold Star winner of the 2013-14 school year. She could not have been more surprised when she walked into the gymnasium to loud cheers and a standing ovation. After the initial surprise, Kellogg wiped away tears. Kellogg says her real reward is seeing her students succeed. Principal Ross Boyett called Kellogg “amazing,” enumerating the many roles she plays at Elm Grove Middle. 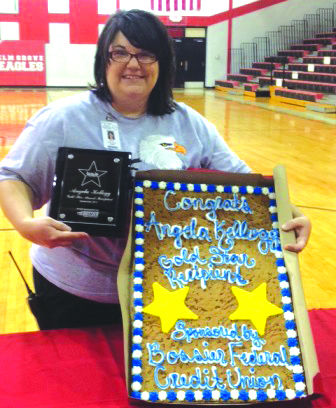 Kellogg was presented a Gold Star plaque by Bossier Federal Credit Union representatives, as well as a cookie cake. She will also be recognized at the October 3 Bossier Parish School Board meeting. Her colleague, Missy Harper, perhaps summed it up best. “There are very few people who not only make an impact in the lives of our students but also make an impact on the employees she works with on a day to day basis,” wrote Harper.